Bonaire Flag Day is an official holiday on the island of Bonaire, which is part of the Caribbean special municipalities of the Netherlands, along with Sint Estatius and Saba. Flag Day in Bonaire is celebrated on September 6. The Caribbean Netherlands do not have a single national flag, they use the flag of the Netherlands instead. Besides, each island has its own flag and celebrates Flag Day as a public holiday. For instance, the flag of Bonaire is honored on September 6. The flag of Bonaire was developed in 1981. One of his creators was Whitney Smith, a notable American vexillologist. 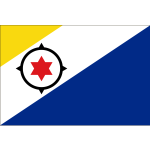 The flag of Bonaire consists of two triangles separated by a diagonal white strip. The larger triangle is blue, it is located in the lower right corner. The smaller white triangle is located in the upper left corner. Blue color represents the sea, and yellow color represents the sun. Inside the white strip, there is a black compass with a red six-pointed star. The compass is a symbol of Bonaire's population: the island is inhabited by people who have come from the four corners of the world. The six points of the star refer to the original six villages founded on the island. Besides, the colors blue, white and red can also be found on the flag of the Netherlands, so they reflect Bonair's loyalty to the Kingdom of the Netherlands.